Crepaway has introduced a large addition to its menu about two weeks ago. This new line-up comprises of a series of spiced up food, new burgers to rave for, and what I think was the best of all, their new recipes of crepes! I attended the pre-launch of their menu with some friends in its Sodeco branch, and we were seriously spoilt like hungry little kids, who might have seen food just once in their entire lifetime. First, we all shared the Fajita pizza that had everything of a pizza plus chicken and a spicy mayonnaise sauce. I would have preferred to have sour cream on top of it instead of the mayonnaise. Then I had the paprika French fries on my own. I loved them, just don’t order normal fries anymore. Then I had the Cordon Blues burger, beef meat with cheese inside of it topped with salad, onion ring, and bacon. The burger’s size was amazing, not just filling but you actually come to this final bite where you feel you’re really not hungry anymore. The bacon was overcooked; I suggest that they go for less crunchy or perhaps you can ask for that. Then I shared the Tortzilla chicken platter with a friend, because I just had to try this crispy chicken. My eyes were already devouring it from the new menu’s picture. It turned out to be as good as my expectations but I was deceived with the sauce, so I didn’t eat it with the chicken. Then we all had a break, because we had been eating way too much. 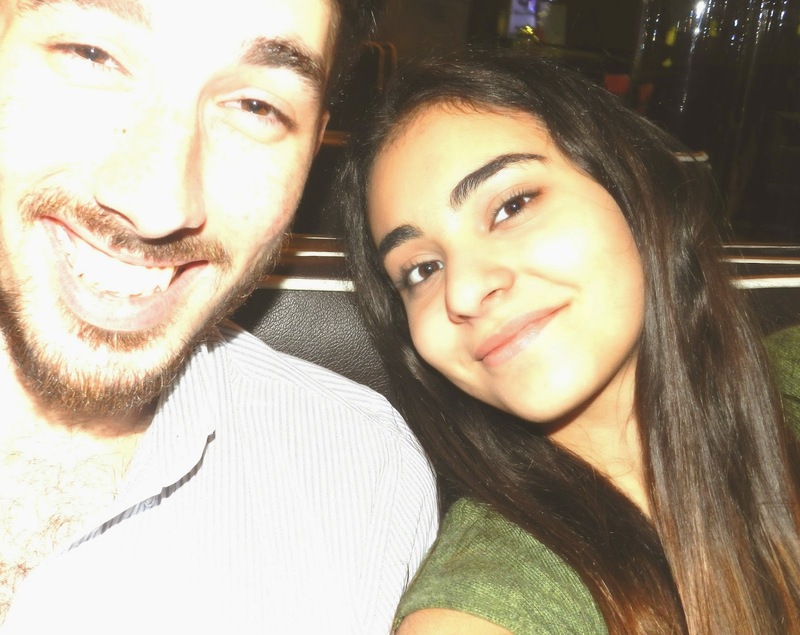 Here with Mohammad; That was the moment when we discovered my cam takes pictures alone when it catches a smile. I was a bit sick that day too. And we decided to share all the desserts among a table of 6. Someone ate the other 2 meringues before I could take a decent picture, yeah people hate me in such moments. and the Valentine which felt like a cheesecake approach, with cream inside of it, and raspberry jam and white chocolate coulis on top with biscuit crumbs.I would have preferred to have vanilla ice cream or whipping cream inside the crepe instead of the liquid cream. Then came the Melteaser, a chocolate and vanilla ice cream cake with Maltesers and the Munchmallow that we ordered twice on the table, so you can imagine how delicious it was! Yes, I ate from all of that. I went back home driving really bad because of how much I had eaten that night. I think I had unbuttoned my pants. My mom who’s my weight-watcher (annoying, yes because I love food) had already prepared my plans for dieting but I surrendered. “Elsa, you have to lose 3 kg (about 6 pounds)”. She was right, and I lost them in these couple of weeks.